My littlest love turned three, and girl is obsessed with lions and leopards and jaguars. She owns our Alexa echo dot, and has her play the Lion King soundtrack on repeat, with occasional baby shark interludes. 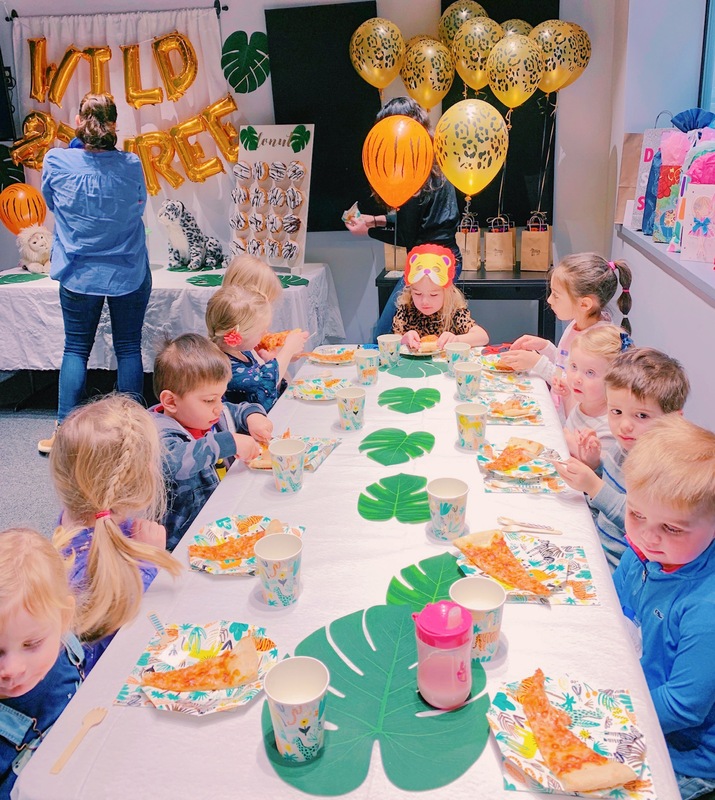 So I wanted to do a Lion King/ Lion Guard inspired party theme without going all Disney. 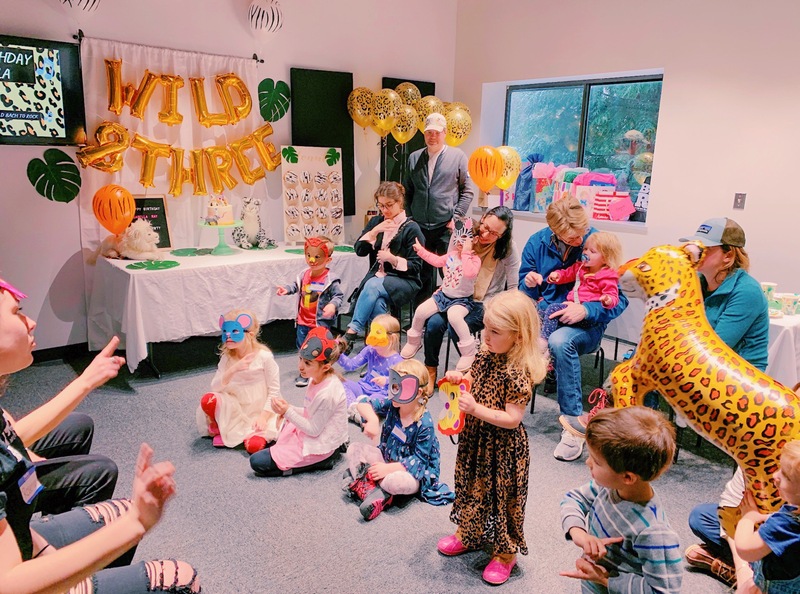 So my cub got a WILD & THREE party. This theme is so fun you guys. 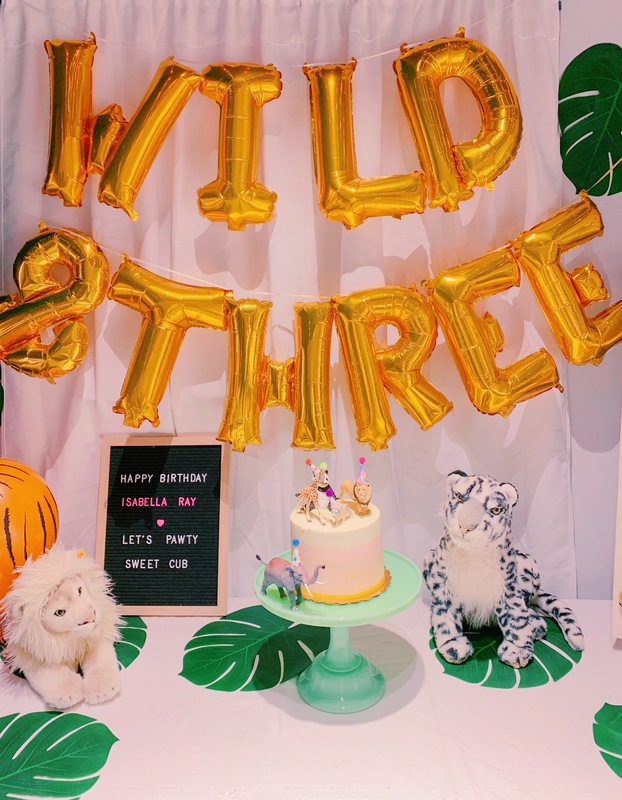 And it would work for a 1st Birthday as well, as a WILD ONE theme! 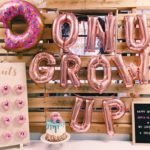 And if you read my Donut Grow Up Party post, you’ll know I love puns, so here we go again, another punny pawty! Look at the adorable invitations I customized on Evite. I mean I can’t help myself. In some parallel life I’d be a party planner, because I love all the details! 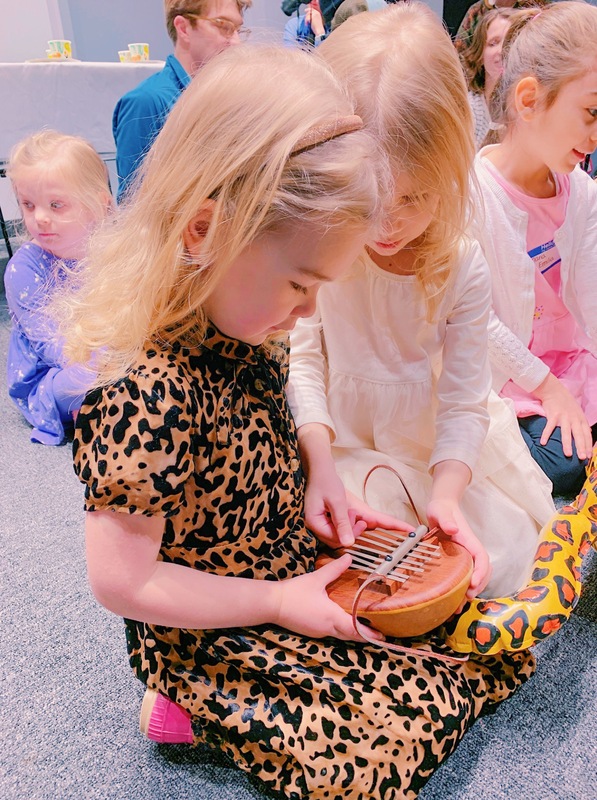 I knew I wanted to do something fun and educational with music, and when I found Bach 2 Rock, a nation-wide brand of music schools with several in our area, I was thrilled. 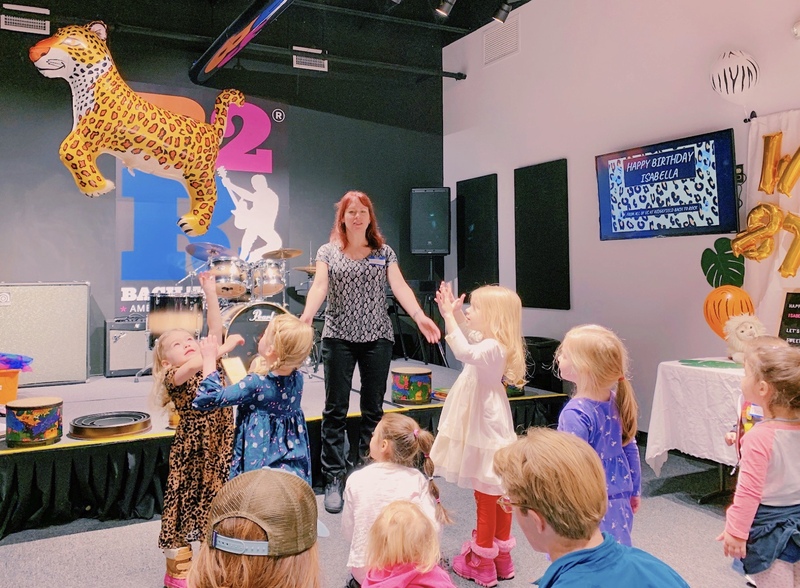 They offer music camps, classes, and party packages for different ages, and I chose the Rock City Birthday Party for her, where the kids get to enjoy a hands on exploration of musical instruments, followed by a pizza and cake celebration! I was very pleased with how it worked out- I requested music that fit the theme and the amazing music teacher Miss Lisa played music from Lion King for a little free-dance session, and then did a show and tell with musical instruments from Africa and beyond, so the kids got to touch and handle the instruments and hear their sounds. After that there was an awesome drumming session, and some fun singing and dancing sessions, with Miss Lisa accompanying on different instruments, and the kids having lots of fun while the parents got to actually talk to each other a bit. 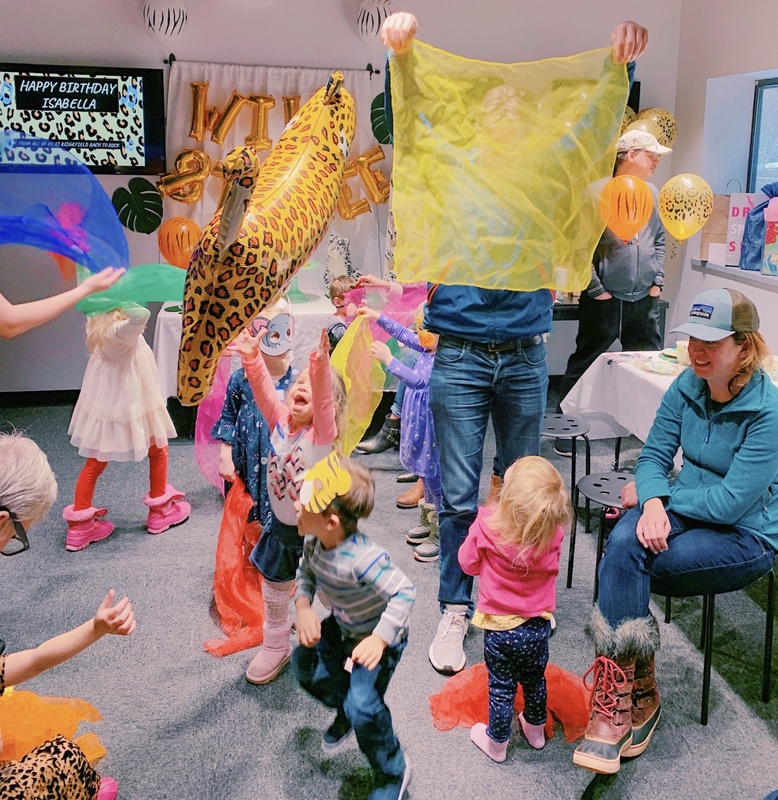 I brought felt animal masks that I had asked her to incorporate into the party and the kids loved it- they got to pick out their mask, and sing and dance around in them. 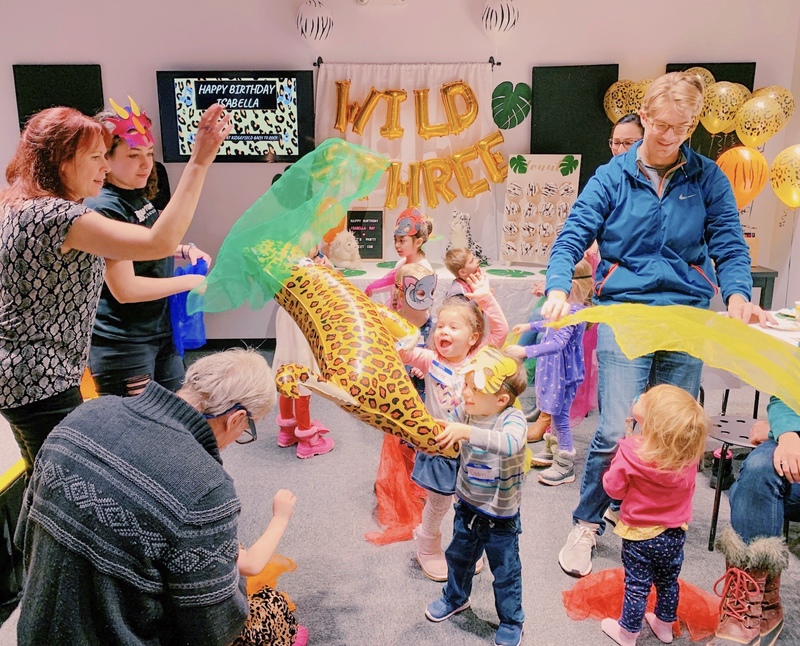 The staff brought out rainbow colored play scarves and the kids and parents had so much fun getting wild, throwing them around and creating a magical rainbow atmosphere. During that mayhem, a little boy named T. gently took Isabella by the hand and led her to the cake table and held her hand for a while. I was dying and exchanging glances with daddy. Afterwards I asked her what they were doing, and she said her friend T. wanted to show her the cake, so they looked at the cake together, holding hands obviously. The kids also had a blast with the floatable leopard balloon who hovered in mid air and was just floating around dancing to the music. This guy who we named Pepper is still living at my house, and has become our family pet. He’s been floating around our house for weeks now so that may be the best money I have ever spent, because the girls are nuts about him. Just to make your life easier if you’re considering this theme for a party, here’s hours of research time saved: I’ve linked the party supplies I got at Amazon for you. 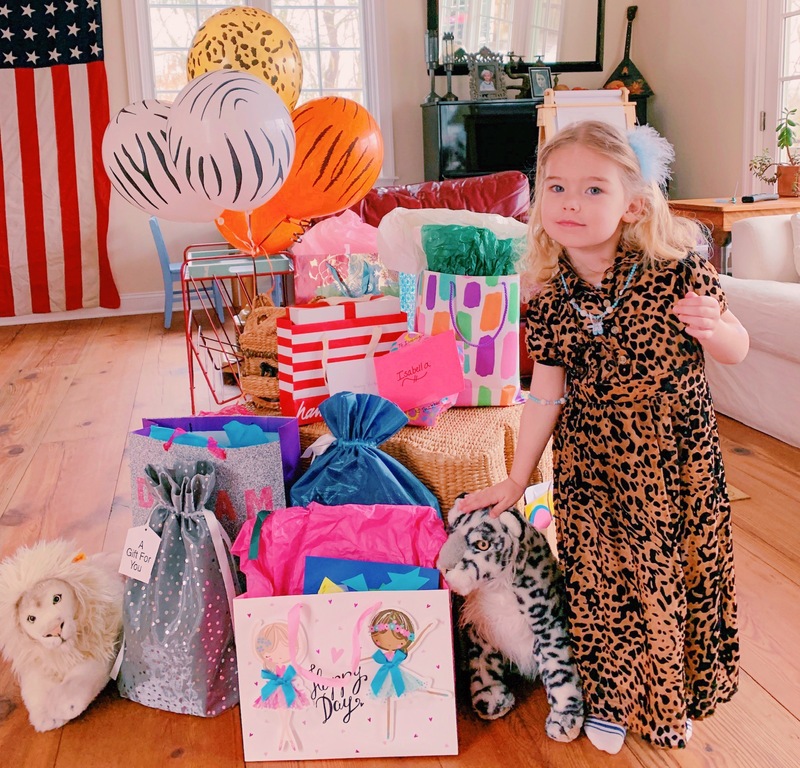 Isabella’s actual Birthday was a few days before the party, and we had a lovely family celebration at home where we surprised her (I shared the reveal on Instagram stories) and one of her gifts was this beautiful long dress in velvet embossed leopard print with puff sleeves, collar, and neck tie ribbon. 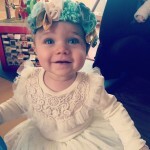 She absolutely loves it and insists on wearing it alllll the time with her leopard print leggings. And I got it in a size 6 because girl is 3 but she’s an avatar, and this way she can wear it for a couple of years, as it goes from maxi to midi lol! I make big babies people. This girl was over 10 lbs when she came out and she’s been off the growth charts since. The dress is from the lovely ladies behind Ivy City Co. 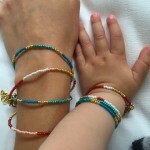 They make adorable matching mommy and me outfits, and dresses for minis. And the quality is bomb. 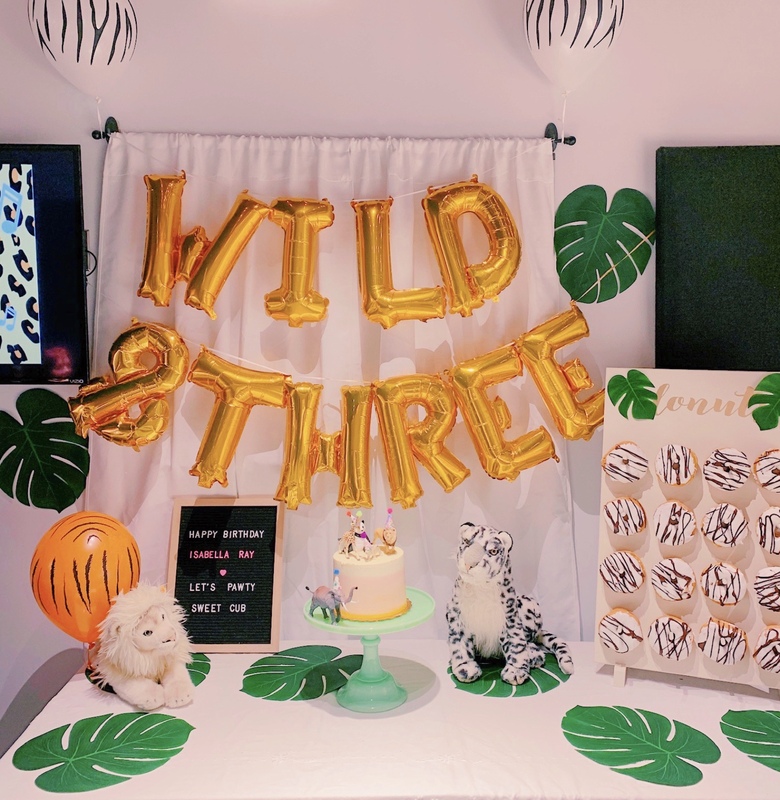 I really loved styling this party theme, and I had prepared a bunch of things I brought with me that Molly and her assistant helped me set up before the party. 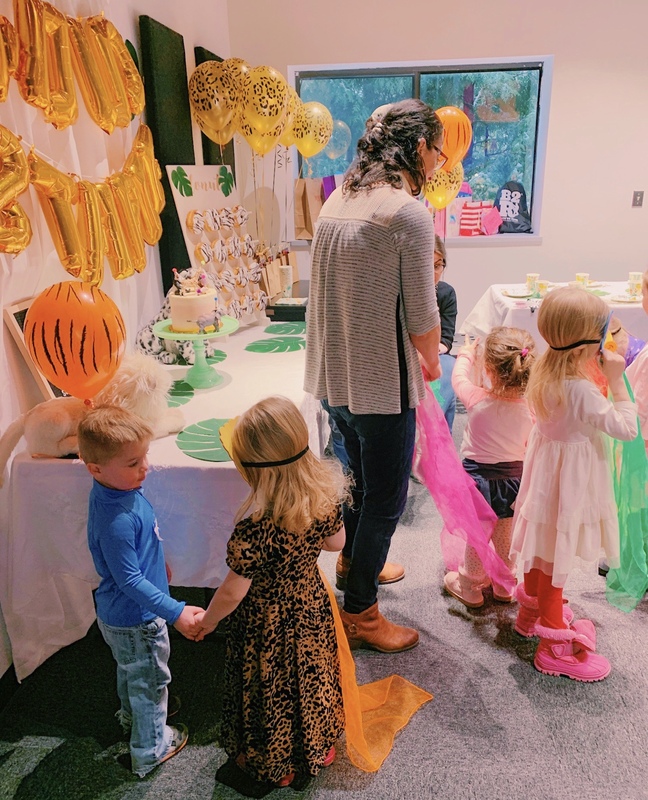 The cake table is of course the centerpiece of the theme, and had two of Isabella’s favorite stuffed animals on it- a big white Steiff lion – and a snow leopard- both of whom flanked the cake. I also brought my letter board and donut wall, which I got from Coogee Studios, a mama-owned etsy shop in Colorado. It’s the second time I’ve used it, and it was perfect for hanging my themed donuts. Lauren makes these by hand, and I highly recommend her donut and pretzel walls for events- they decorate the space and create such a wow factor, plus you get to display the treats beautifully. I got zebra donuts from a local bakery- Uncle Leo’s Coffee and Donuts in Wilton, CT, and they were so good- the whole room smelled of freshly baked donuts! 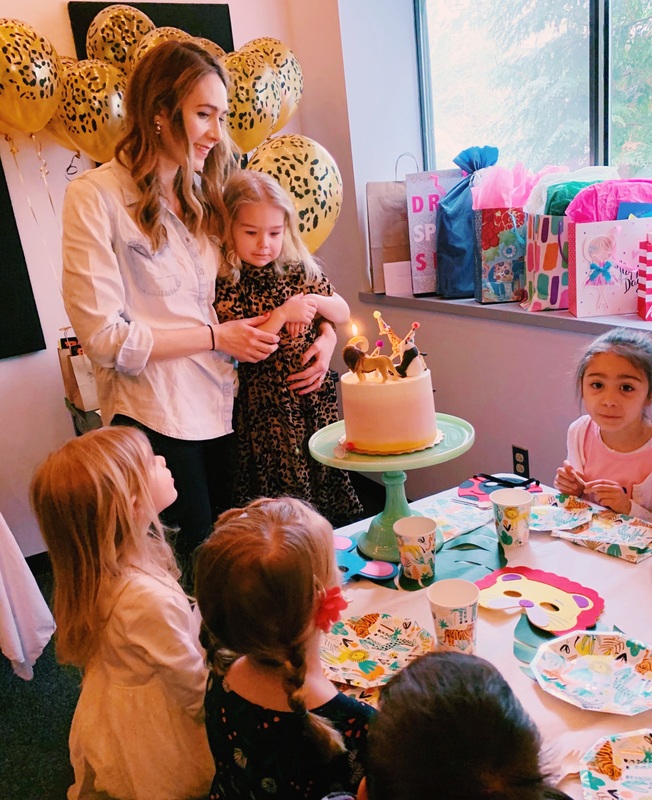 After the music entertainment portion of the party, the kids took their seats at the Birthday table headed by Isabella. I had a zebra and leopard balloon tied to her chair. 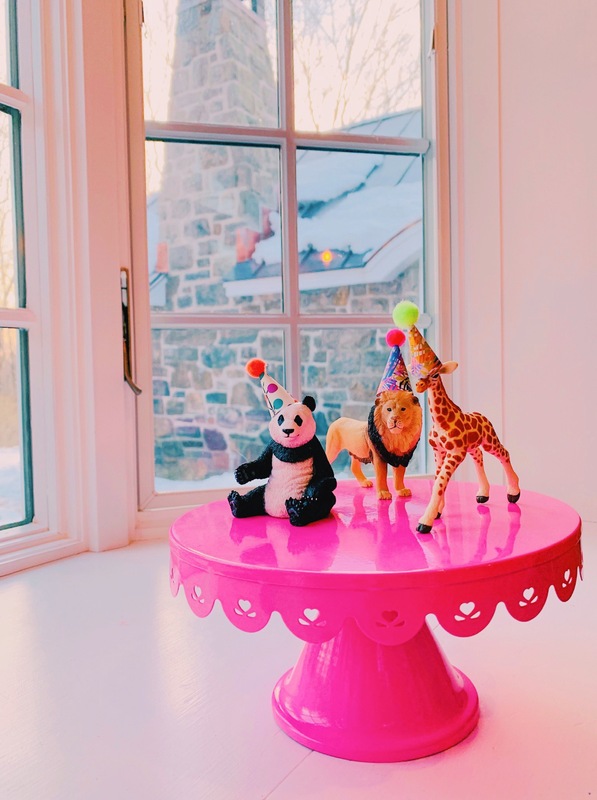 For the Birthday table decor, I used paper plates and paper cups from daydream society, a stylish party supply company that is next level. Their Into the Wild collection was a perfect fit for the Wild & Three theme. 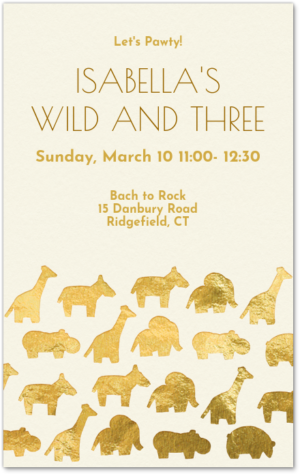 It features Isabella’s favorite lions, tigers, zebras, and giraffes in a chic jungle setting. I also decorated the table with Mostera leaves, and used wooden mini forks from our local party store to use less plastic. The cake was a peachy blush ombre double six inch vanilla buttercream from Whole Foods. I love Jess the Cakestress there and she is so great to work with. I email her my idea of evoking a sunset over the savannah, and it worked out beautifully. Plus the cake tasted incredible and they use only all natural non toxic dyes and ingredients. I placed the cake on my new Jadeite cake stand that the hubs got me on our last visit to terrain, one of my favorite stores on earth. I love vintage mint and Jadeite everything, and the color contrast was perfect with the cake. I had so much fun making the cake toppers for the cake! I ordered some beautiful Schleich animal figurines (their hand painted animals are a league above and are truly collectible) and made tiny party hats out of origami paper and mini pom poms! 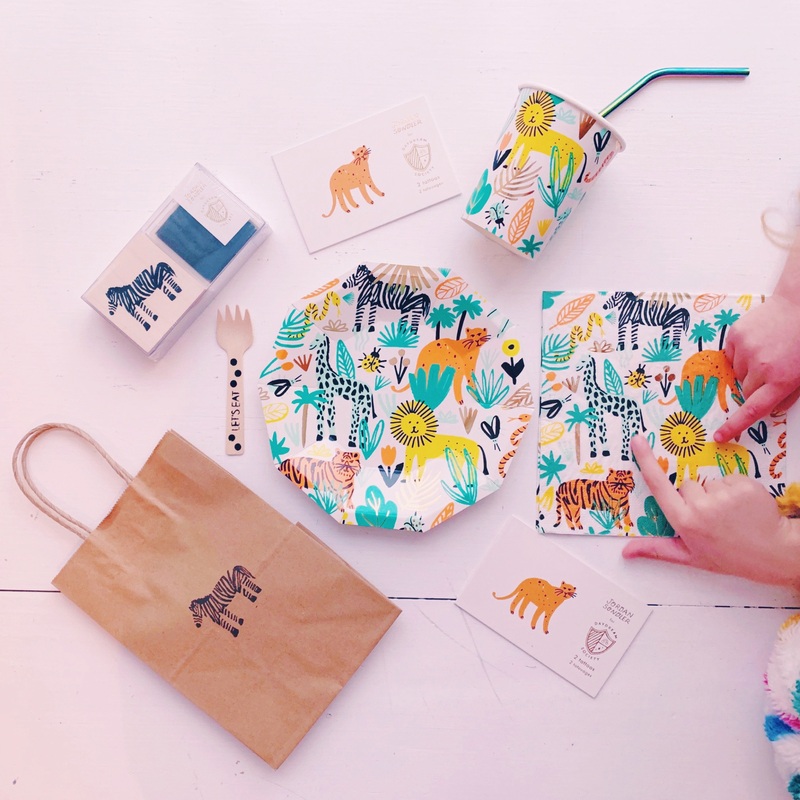 party supply goodies from daydream society’s into the wild collection. I went a bit over the top with the goodie bags this time but this theme is just so cute, it’s easy to get carried away. Bach 2 Rock provides their own goodie bags, the contents of which I added to the goodie bags I made. 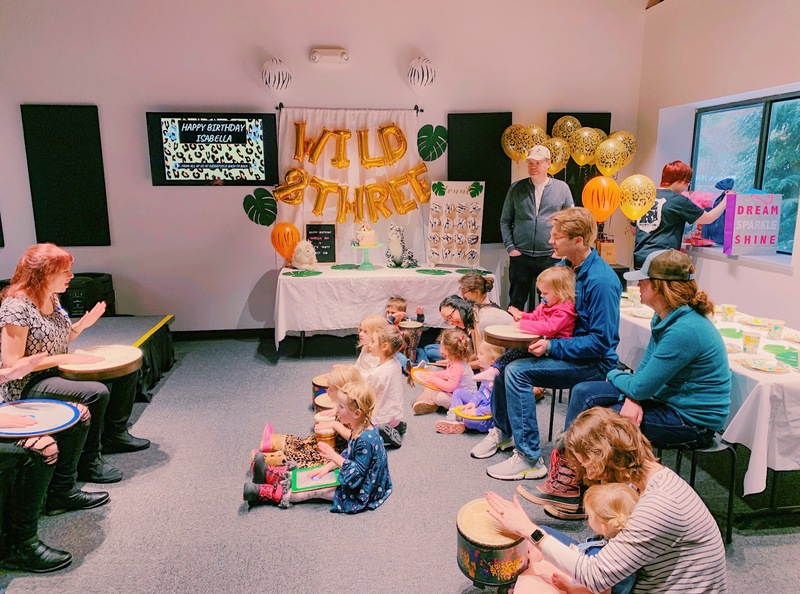 Their fun swag includes one free music lesson for each child – how awesome is that! I made my own bags out of small Kraft paper bags, which the girls helped me decorate with a zebra stamp from daydream society. I added the wooden zebra stamp set and into the wild temporary tattoos from daydream society for each child, as well as a mini safari animal figurine I got on Amazon. And we tied leopard print golden balloons to the bags, for a really cute overall effect. Plus the kids got the keep the felt animal masks they played with, as the felt is quite durable and re-usable. my cub wearing her leopard dress with leopard leggings petting her stuffed snow leopard standing beside a leopard table filled with gifts from friends and family. thank you for making her birthday so special! 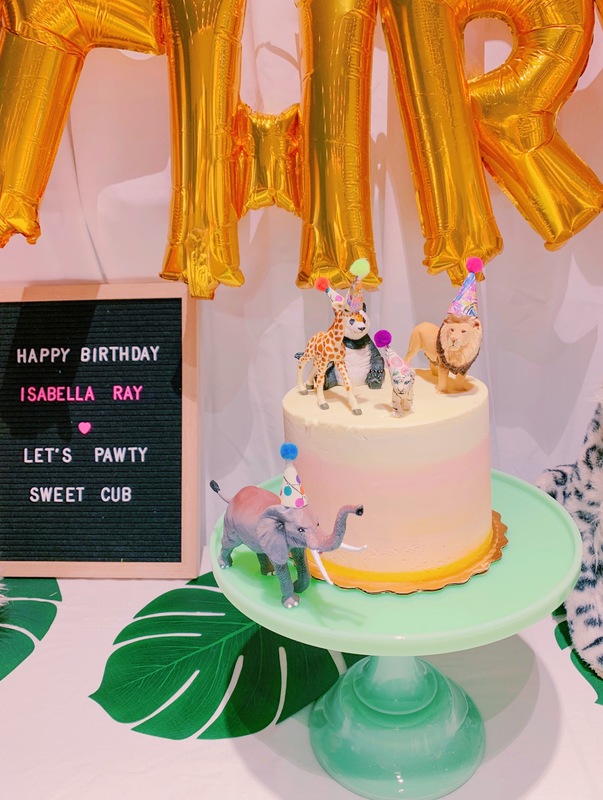 So that’s all the party deets for Isabella’s Wild & Three Birthday Pawty! Follow me on Instagram, where I share behind the scenes in stories, and pretty inspo in my feed. Comment or DM me that you found me through this post, and I’ll follow you back! Thanks for posting this wonderful party!